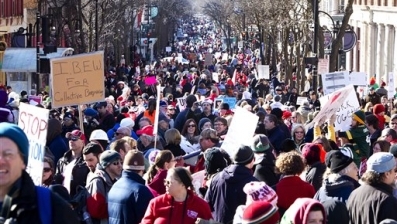 The head of Wisconsin’s powerful teachers’ union is calling on educators to return to classrooms Monday and Tuesday rather than continue being absent to protest an anti-union bill at the state Capitol. Hmmm. Isn’t this an admission that the union has knowledge of an illegal strike? And if that’s the case shouldn’t the union have to pay substantial fines? And shouldn’t teachers that can be identified in photos and video of the protests lose their jobs for breaking the law? We wouldn’t want the children to think they can break school rules and get away with it and the best way to make the point would be to punish the law breaking teachers and union to the fullest extent of the law no? Nope, children need to be taught to stand up for what’s right, even when it’s not popular. Conservatives have destroyed our country. It was just a dozen years ago when we had a thriving economy and a balanced budget. In just a few short years, we went from that to a country on the verge of collapse. This could very well be the end of America. The American dream is all but dead. If we ever get our debt paid off, it will be a miracle. Conservative policies are the reason for the debt. I just checked out your blog and realized that my Libertarian views and your views can never be reconciled. Thanks for reading though. I agree that some conservative policies are to blame… Hands off policies on Social Security, Medicare and Military spending but Liberal policies are equally to blame for our financial issues. Moreover UNION policies are to blame for the killing of companies resulting in the loss of jobs of their own members. It’s time for non-public union citizens to stand up and say enough is enough. “Standing up for what’s right” includes obeying the law of the land and following the contract you are supposedly trying to protect. No? if the Democratic Party failed to keep the billions in Tax Dollars flowing to all these groups the Democratic Party would be in serious trouble.